We are delighted to announce the long awaited update of the UBI Global Study! You can now download the new free 2016 abstract by filling in the form below. The Usage-Based Insurance market has continued to grow rapidly since 2013 and is now estimated at 12 million drivers globally. Telematics continues to radically transform the world of auto insurance, not only with different devices, but also by using more of the car’s data directly. This new update brings the insurance industry closer to the world of autonomous vehicles and is the first to estimate the impact of autonomous functions will have on claims as well as the timeline of the impact. The UBI Global Study remains the most comprehensive report on the telematics insurance sector, now with more case studies, more company profiles, more segmented focus and an exclusive market forecast until 2030. Now since November 2016, the study also comes with the Connected Insurance Analytics report, an add-on to the UBI main study specifically dedicated to dealing with big data analytics. 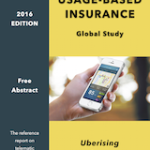 Based on more than 200 new interviews, the UBI study 2016 targets insurers and telematics service providers as well as technology providers. It also addresses the core issues and solutions for new players to start successful programmes or to approach new or immature markets. To give you an idea of the scope of the full study, we are publicly sharing the first part. At 125 pages, the free abstract is only a fraction of the full study. Simply fill in the form below to receive the link by email.